Festaff have just opened applications to volunteer at some of this year’s biggest festivals. The organisation offer a decent number of positions and provide volunteer wristbanding staff, among other roles. The company is involved with over 20 events each year and have over 25,000 people on their database. They claim that 90% of the shifts would not clash with the headline acts and that the shifts are usually completed in the first few days before bands really hit the stage. Of course, there are a few caveats to joining their crews. Volunteers will be required to attend a “twin” event during the year due to their high demand, which means working at at least two festivals during the summer – so only apply if you are prepared to do this. It’s worth noting Festaff has a priority list for people who’ve volunteered with it at other events in 2018, but is expecting there to be plenty of spaces for newcomers. Checking wristbands at the Glastonbury gates. You will be required on site from around 5pm on Monday 24th June until around 8pm on Sunday 30th June 2019. These shifts will be on gate duties and you should be able to get a couple of these out of the way before the main stage even fires up! A minimum of three eight-hour shifts plus training/set up over 6 days. In addition, you’ll need to volunteer at another ‘sister event’ with Festaff (Please see below for further info). Shifts will be allocated on site – Wednesday to Sunday. A £240 deposit, of which £15 is an admin fee and will be deducted before the deposit is returned. Deposits will be returned after both Glastonbury and selected sister event are completed to a satisfactory standard (No deposits will be returned on site – any all refunds of bonds will be done post-event). 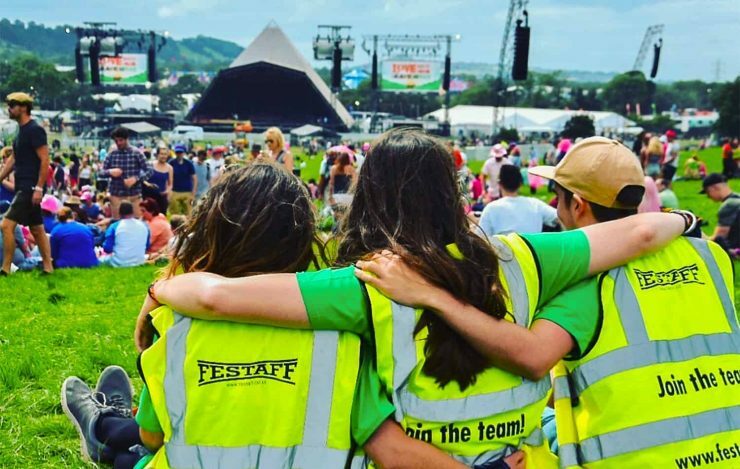 If you complete your service with Festaff this year and secure a spot at Glastonbury while also completing your sister event, you will receive an invite for 2020. Please read the full information carefully on the Festaff website which can be found HERE. Answers to FAQs and advice on Festaff’s Glastonbury Festival 2020 applications can be found HERE. Glastonbury 2019 will take place between June 26 and 30 at Worthy Farm, Pilton, Somerset.